Greek riot police tear gassed protesting school teachers protesting in Athens on January 14, Morning Star Online said. It came just days after the country’s public order minister accused police officers of indiscriminately attacking teachers in similar circumstances. Thousands of teachers took to the streets to express their anger at the government’s process for hiring new staff in state schools. Nearly 2000 retired workers and Social Security department workers gathered in Athens on October 3 to protest “inhumane” cuts to pensions. An army of 1500 senior citizens marched behind banners, chanting “shame on you” and calling for the government to cancel the memorandum that has led to ongoing cuts since 2010, with further cuts set for 2019. A fire broke out at a migrant camp on the Greek island of Lesbos on July 10, following a protest at the site demanding better living conditions. Local authorities told the Xinhua News Agency that the fire at the Moria camp had been extinguished and that at least five container units and three tents were destroyed. No injuries were reported. The situation is deteriorating in “the Jungle” — the informal settlement in the northern French port of Calais of refugees trying to reach Britain. French police demolished the southern half earlier this year, yet the population is steadily rising and has surpassed 10,000. Neglected by governments and NGOs, the volunteers who provide food, clothing and other aid are receiving fewer donations to assist the growing population. Hunger has become prevalent, along with diseases caused by lack of sanitation. 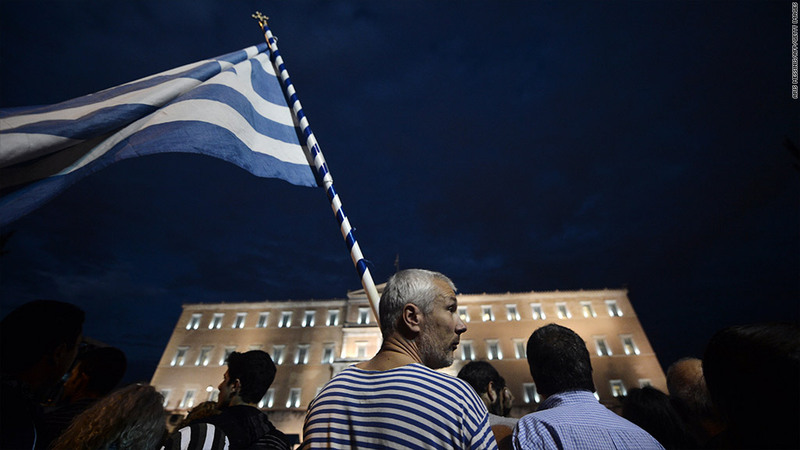 Washington pressed Greece on July 21 to cut public spending to the bone in return for the latest slice of bailout money, Morning Star Online said. After a meeting with Greek finance minister Euclid Tsakalotos, US Treasury Secretary Jacob Lew said Athens needed “to make headway on the next set of milestones due in October”. It is very hard to find words that can even begin to describe how progressive people all over Europe are viewing the “pact of shame” over refugees reached between the European Union and Turkey on March 18. For €6 billion, the promise of accelerated EU access and a conditional end to Turkish citizens requiring visas to enter the EU, the agreement makes the repressive Turkish government of Recep Tayyip Erdogan the main cop controlling the flow of refugees towards Europe. In the face of the brutal and immoral reaction of the European Union to the tens of thousands of refugees fleeing into Europe from wars and poverty in the Middle East and North Africa, Barcelona council has taken the initiative to set up a network of Mediterranean city councils prepared to welcome and house asylum seekers. Barcelona is already part of a broader network of European cities welcoming refugees. French riot police fired tear gas as they began demolishing the Calais “Jungle” refugee camp on February 29, Morning Star Online said. Tear gas was reportedly used in response to stone-throwers at the shanty town, which is home to about 4000 people. Lines of police vans gathered on the perimeter of the camp's southern section and people were prevented from entering the site.